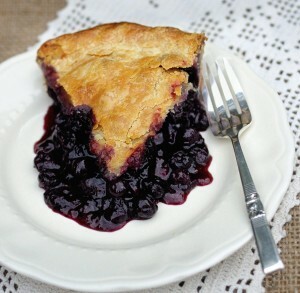 Blueberry Pie :: Oracibo.com - Food, Travel, Design and Cooking! Just picked up a box of fresh blueberries from Gelderman’s Farms so it’s all blue this week! I always prefer to use glass pie plates as they give such a nice crisp crust! Prepared pie dough for a 2 crust pie; either your favourite crust or see below for the link to to mine! Combine the sugar, tapioca & cinnamon in a large bowl; add the blueberries & lemon juice & fold together. Allow the mixture to stand while you roll out the pie dough. Once you have lined the bottom of the pie plate with the rolled out crust, add the blueberry filling, place the top crust over, trim & crimp the edges to your liking, cut vents into the top of the pie to allow steam to escape during baking. Brush the crust with cream & sprinkle with sugar if desired. Place the pie onto a baking sheet & bake for approximately 45 minutes, checking after 35 minutes. If the pie is browning too quickly, loosely lay a piece of foil over the pie and continue baking until the filling is bubbly and the crust is browned. Place the pie on a baking rack to cool completely. Serve with ice cream if desired or a combination of lightly whipped cream & either sour cream or mascarpone! For the recipe to my pie crust, click here.